The insurance industry does not want you to read this book. This book gives you knowledge from an insider. This knowledge will empower you to take simple steps that can protect your life’s savings from long-term care expenses. In 2005, Congress passed legislation that gave each state the authority to develop “Long-Term Care Partnership Programs”. These programs are a partnership between the federal government, your state government, select insurance companies, specially-trained insurance agents, and you. These programs encourage the middle-class to purchase unique, government-approved insurance policies with long-term care benefits equal to the amount of their net worth. If their policy runs out of benefits they can apply for Medicaid to pay for their care and their assets can be protected from Medicaid (both while they are alive and even after they pass away.) You can target how much long-term care benefits you need based on how much of your assets you want to protect from Medicaid. If you want to protect more savings you can buy more benefits at a higher premium. If you have less savings you can buy less benefits for a lower premium. It’s an equitable and affordable solution for those who want to plan ahead. Click the book to preview the first two chapters for free. You can purchase the book from Amazon to be read with a Kindle Reader or get it in paperback. 5.0 out of 5 stars Direct, frank advice! 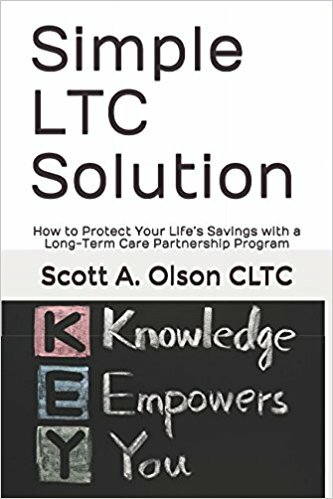 This book provides straight-talk about buying LTC insurance. Don’t assume that just because an agent or even your investment adviser says their new option is “best”, it’s likely not best for you. Scott’s book gives you the tools to ask the right questions to get the best coverage for you and your family. #1: Don’t be afraid to shop around! And never get pressured into buying something on your first call or appointment.